Wednesday February 13th 1878 I went up to see Miss Lewis this morning but came back just before noon. I knit in the afternoon and just before supper walked down to come up with Charlie. Spent the evening visiting. Thursday February 14th 1878 It was so snowy this morning that I did not go up on the hill again. I was busy knitting all day. John Seerly called in the afternoon. Charlie came up from the store early in the evening to visit. We got word from Rob that I must come home tomorrow. 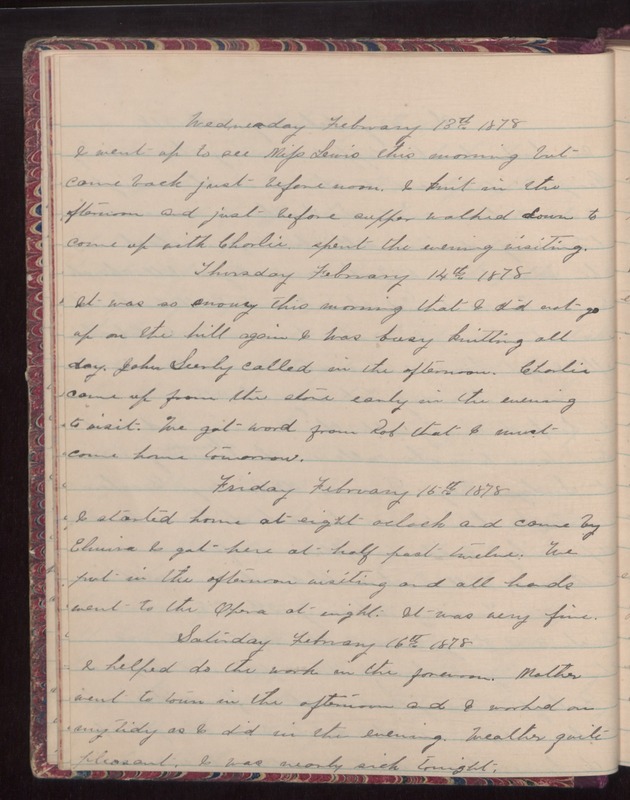 Friday February 15 1878 I started home at eight oclock and came by Elmira. I got here at half past twelve. We put in the afternoon visiting and all hands went to the Opera at night. It was very fine. Saturday February 16th 1878 I helped to do the work in the forenoon. Mother went to town in the afternoon and I worked on my tidy as I did in the evening. Weather quite pleasant. I was nearly sick tonight.